Jordan Peele seems like a man with the world at his feet right now. Already a prolific actor and experienced writer, this film – his directorial debut – is on its way to making $200 million worldwide off the back of a $4.5 million budget, not to mention a 99% rating on Rotten Tomatoes. And this is for good reason: Get Out is a brilliant satire/horror film, and one that is written and directed with absolute precision. Daniel Kaluuya plays Chris Washington, a photographer who’s been dating Rose Armitage (Allison Williams) for four months. As the film begins he’s going to meet her parents for the first time at their country mansion, and it’s quickly clear to the African-American Chris that he’ll be treated as an outsider in this thoroughly Caucasian neck of the woods. Rose’s family aren’t the bunch of redneck hicks that you’d expect to see in a horror film, however. Their prejudice is more subtle, like people who consider themselves benevolent, when they’re simply being racist. The more time Chris spends with them, the creepier things get. And pretty soon he wishes he’d never made the trip in the first place. Just the notion of a horror comedy about racism should set off warning lights for any would-be screenwriter. This is the kind of film that’s difficult to pull off. Any slight misstep and you could veer into gauche exploitation, or at worst, flat-out offensiveness. And yet Get Out is pitch-perfect. Every single moment is handled beautifully, and Peele’s script knows exactly when to back off and when to push the pedal to the floor. I haven’t seen a film quite like this, however the original version of The Stepford Wives comes close. Get Out was released by Jason Blum’s Blumhouse productions, a studio that can easily be described as the modern-day saviour of the low-budget, major-release film, even if they most recently subjected us to the latest M. Night Shyamalan misfire, Split. Kaluuya is great as a man going through a deeply traumatic meet-the-parents experience, whilst Williams is confident and genuine as Rose. Bradley Whitford and Catherine Keener have an excellent time, and truly excel at being ever-so-creepy. 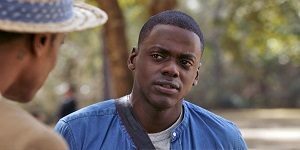 A brilliant and honest comedy with horrific undertones, Get Out cleverly uses its genre trappings to create a bold and unique film. Where Colossal made me uncomfortable with its exploration of darker themes seen through a sci-fi/comedy lens, this film hits every beat perfectly. I can’t think of anything that would make this film better. This entry was posted in Film Reviews and tagged Comedy, Horror, Satire, Science Fiction by Stuart Wilson. Bookmark the permalink.